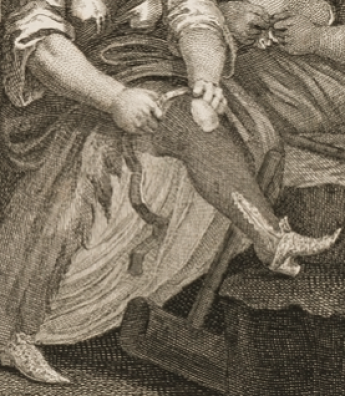 On December 1st, 1722, Margaret Hayes went into a shop and began to barter with the owner, Elizabeth Reynolds, over the price of a pair of stockings. In the middle of their discussion, she grabbed the stockings, which were on display and ran out into the street. Alerted by Elizabeth’s cries, Margaret was pursued by a number of people and dropped the stockings to the ground just before she was apprehended. At the trial she denied ever having gone into the shop but was found guilty of theft. As the goods were priced at the princely sum of two shillings, Margaret faced a penalty of death by hanging. Often in these cases though, the jury would take pity on the felon and devalue the stolen goods. Mercifully, this was exactly what happened to Margaret; the jury devalued the stockings to ten pence and she was transported to the American colonies for a period of seven years. Most surviving accounts of transported convicts focus on notorious criminals or scandalous circumstances. However, the overwhelming majority of those transported to the colonies were ordinary men and women, convicted of petty offences. After being handed down their sentences they promptly disappeared from the history books. The only reason we know anything about Margaret is that she was one of the passengers on board the Jonathan, which sailed from London on February 19th, 1723. The Jonathan was a former slave ship and was bought by Jonathan Forward for his fleet. The difference with this vessel was that records were kept of all the convicts on board. From the ship’s records we know that Margaret was thirty years old, she was a widow with a dark complexion. But we don’t know why she risked going to the noose all for a pair of stockings. Were the stockings fancy and she simply had a love of fine things, or was it freezing cold that day she and needed something to cover her legs? We also don’t know whether or not Margaret had children, and if so, what happened to them. Conditions on board the ships were horrendous; many convicts died of cholera or typhoid during the voyages. Those that survived were severely weakened by scurvy, dysentery and fever. Convicts went on board shackled and in chains. A hatch was opened and they went below deck, where they would spend the rest of the voyage. Usually the chains were removed in the prison deck but sometimes not. They were allowed on deck at intervals for fresh air and exercise at the whim of the captain. If they survived the voyage, convicts were sold to plantation owners and worked alongside indentured servants and African slaves. The status of convicts varied depending on the plantation; some were treated in line with indentured servants while others were subjected to the same forms of degradation as slaves, the big difference being that the convicts were only sold for the terms of their criminal sentences. Nobody knows what happened to Margaret, or whether she made it as far as America. Most of the convicts at that time were illiterate so there are very few surviving journals. The Jonathan caught fire after it landed in Maryland and never made it back to England. Emma Rose Millar was born in Birmingham – a child of the seventies. She is a single mum and lives with her young son who keeps her very busy and very happy. Emma left school at 16 and later studied for an Open University degree in Humanities with English Literature. She has had a variety of jobs including chocolatier, lab technician and editorial assistant for a magazine but now works part-time as an interpreter. Emma writes and edits historical fiction and children’s picture books. She won the Legend category of the Chaucer Awards with Five Guns Blazing in 2014. Her novella The Women Friends: Selina, based on the work of Gustav Klimt and co-written with author Miriam Drori will be published in December 2016 by Crooked Cat Books. Emma is an avid fan of live music and live comedy and enjoys skating, swimming and yoga. You can read more about her exciting pirate novel Five Guns Blazing on our sister blog here. Reblogged this on Emma Rose Millar. Fascinating post. Can’t help but wonder what became of her–and why she wanted the stockings. Thans for sharing! God luck with Five Guns Blazing! Have just finished reading Five Guns Blazing and I loved it. I believed in the people and got caught up in their lives. The descriptions of the conditions they would have lived with were very well done. Thanks, Emma and Jessica. I’ve read that those who committed petty crimes, and major ones, weren’t the only ones who might get transported. So could debtors and political dissidents. Some crimes, such as performing abortions and trying to commit suicide, were activities we no longer consider crimes. And to ask a rhetorical question, how many transported convicts were members of the upper classes? This was a terrible episode of the past. But to put it in context, consider how different the history of the United States and Australia might’ve been otherwise.